Diana Seitz lives in Gladstone. Her parents were Lawrence and Barbara Wakeland and they are both deceased. She was born in Muscatine, Iowa and grew up in Wapello, Iowa the youngest of seven children. Three of her sisters still live in Wapello; Joellyn McKinney, Michelle Gerst and Melissa Schoonover. Another sister Nancy Nylin lives in Keithsburg. Diana also has two brothers. Bill Malcom lives in Mediapolis, Iowa and David Malcom lives in Mechanicsville, Iowa. Dianas' grandparents were Winnie and Charles James from Wapello, IA, and Elsie Wakeland Cozad who is originally from the Millersburg, Iowa area and moved to Wapello, IA. She graduated from Wapello High School and while in school she played basketball and softball. As some of you may know, girls basketball has long been a very important part of Iowas' history. Diana revealed that she even played when the game was three on three. For those Illinois people who have never seen an Iowa girls team play that way, it means they have three guards who stay to guard their own basket and three "traveling' forwards who can go full court to move the ball back to their basket. It was always fun to watch and the competition in Iowa was terrific. The six player girls basketball ended in 1993 when they changed to five players who can cover the whole court. The history of Iowa girls basketball is very interesting, but that's another story. After graduation, Diana attended Kirkwood Community College in Cedar Rapids and the University of Northern Iowa in Cedar Falls, Iowa. She worked in Burlington, IA, previously with the Heritage Medical Equipment and Supplies Company. 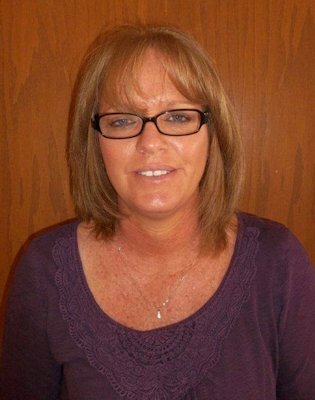 She is presently the Office Manager for the Henderson County Home Health and Hospice. She really enjoys her job and says Henderson County is very fortunate to have a health department that has so many types of services. She invites all to stop by and visit their facility to see what they have to offer. Diana was married to Donnie Seitz in 1996. He is the Chief Deputy for the Henderson County Sheriff's Department so he's working to keep the county legal while Diana is working to keep the county healthy! She is a member of the Gladstone United Methodist Church and she has three children. Stacy Lumbeck lives in Oquawka and is a Certified Nurses Aide at Bickford Cottage in Burlington, IA and she has Diana's first "wonderful' grandson, Parker James Lumbeck. Darcy Lumbeck lives in Gladstone and is a full time student at Southeastern Community College in Burlington, IA, and she works at Menards in West Burlington, Iowa. Thomas Seitz lives in Gladstone and is a junior at West Central High School and he works at Shopko. Everyone is busy and going different directions like so many families, but they have really enjoyed togetherness on family vacations and activities. Diana said they used to have a camper and filled their weekends with camping trips. That was before cell phones and now they stay in touch with cell phones. Can anyone relate to that? In the future Diana is planning to slow things down a bit and relax with Donnie. They'll take day trips and hopefully spend some time on the river. Donnie will fish and Diana will watch. That sounds like a good plan for the summer!